Chris Roach is a fast-rising Comedian/Actor born and raised in New York. He has brought his unique and self-deprecating sense of humor to some of the biggest and best-known stages in the country, such as Carolines on Broadway, The Borgata in Atlantic City and The Paramount in Huntington, NY. He recently toured as the opening act on Kevin James’ 2019 tour all over the Northeast. 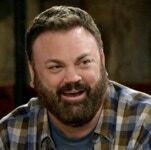 He is best known for his major recurring role of Mott in the hit CBS sitcom KEVIN CAN WAIT and has also appeared in numerous other episodics, both comedies and dramas. He also created the viral video ode to his beloved hometown RONKOKOMO which has nearly two million views across all platforms. He currently co-hosts two weekly podcasts – the popular new Long Island Explained podcast, which focuses exclusively on historical and pop culture events from his native Long Island and Comedians on Hockey, featuring Chris and his comedian friends talking seriously, but having fun, about all things hockey. CHRIS ROACH ACTING REEL 4 from Christopher Brian Roach on Vimeo.